With the beginning of October, many of us are getting excited about the fun autumn activities ahead, like picking a pumpkin, hayrides, football games, and of course, dressing up for Halloween. But one really special aspect of October that stands out to us here at 180 Medical is that this entire month is dedicated to raising awareness about a condition known as spina bifida. Spina bifida is a congenital development disorder that occurs when the central nervous system (brain and spinal cord) does not form normally in the womb during pregnancy. When this happens, some vertebrae of the spine remain open, and in some cases, there is a fluid-filled sac on the spinal cord. People born with spina bifida can still lead fulfilling lives, although they may face many surgeries and future issues related to their challenges, such as not being able to fully move or control the lower parts of their bodies or loss of bowel and bladder control, and more. What causes Spina Bifida? Can it be prevented? There is not a specific known cause of Spina Bifida at this time. However, studies show that most cases of Spina Bifida can be prevented if an expecting mother has enough folic acid in her body before and during pregnancy. Learn more about folic acid and what the best sources of supplementation for your diet are at the CDC’s official website here. We have been and continue to be proud sponsors of various programs and events that support awareness and funding for various Spina Bifida organizations, such as the Spina Bifida Association’s Walk-N-Roll events, or their Education Days, which are affordable, life-changing events that bring the latest news and research while offering support to those with Spina Bifida and their families. We are honored to offer an annual scholarship program to help those with Spina Bifida, spinal cord injuries, transverse myelitis, and/or a neurogenic bladder. 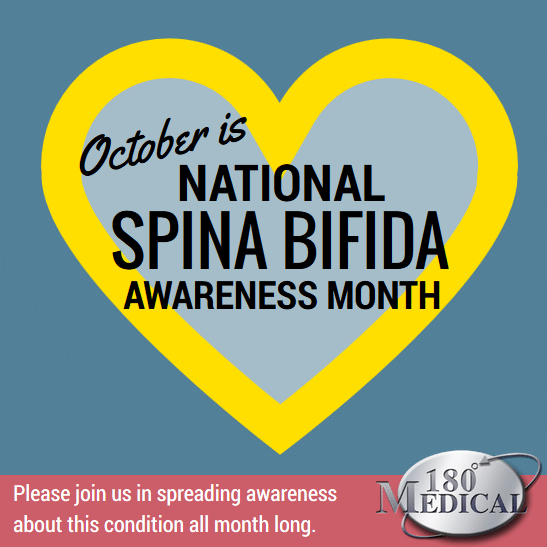 Please join us and the Spina Bifida Association (SBA) in spreading awareness about this condition all month long. If you’d like to share your story about how Spina Bifida has affected your life or someone you love, or how 180 Medical has helped you, please “like” us on Facebook at www.facebook.com/180medical and leave us a comment! You can also check out the Spina Bifida Association at their Facebook page or at their official website. How much do you know about Spina Bifida? Take the CDC’s quiz to test your knowledge.